Back in the late '70s, DC was looking to copy the success Marvel had found with its comic version of Conan the Barbarian. Their solution was a pastiche of several classic sci-fi and fantasy elements blended together as "The Warlord." On a routine mission, test pilot Travis Morgan mysteriously lands in the land of Skartaris. Hailed as a warrior savior from the sky, he has no choice but to stay and fight the evil Bromis and his minions. 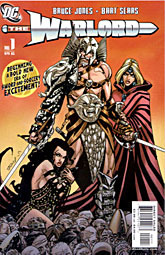 DC hadn't had much luck with "sword and sorcery" books, so creator Mike Grell was all set to take his idea to another company when his editor, Carmine Infantino, asked to hear the pitch. He liked what he heard, guaranteed the book at least a year's run, and The Warlord debuted in First Issue Special #8, becoming the only FIS alum to actually get an ongoing series. Oh, but despite that guarantee of a year? The ongoing was cancelled after #2. 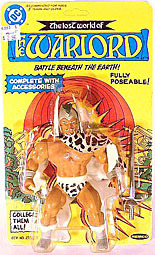 This Warlord figure isn't based on the '70s version, but on the recent failed revamp by Bruce Jones and Bart Sears. Sears' artwork is known for its thick, exaggerated musculature, but that's not really evident on this figure - which may be a plus. Ray Villafane has done a good job of creating a typical muscular barbarian-style hero without turning him into an ugly mess. A single peek at the costume should be enough to convince anyone that this isn't a superhero. Warlord truly looks like a barbarian warrior, complete with mismatched armor, a loincloth, leather straps and a smattering of chain mail. His design is almost entirely asymmetrical, which helps sell his "savage man in a savage time" persona. Everything's detailed nicely - particularly all the angry little faces all over the armor. Speaking of faces, there was once a meeting between Travis Morgan, the Warlord, and Ollie Queen, the Green Arrow. It was pretty much played for laughs, because the two guys looked almost exactly alike - the only real difference was that Ollie was blonde, while Travis's hair was white. They both had the same sort of short haircut and, more importantly, they both wore their beards in a distinctly pointy style. Other than the addition of a small ponytail at the back, this figure captures that similarity very well. A Warlord can't go to war without his weapons, and this one delivers. His winged helmet is removable, he's got an 8½" spear and a rapier with an ornate handguard. The sword fits tightly (perhaps too tightly) in a scabbard that hangs, via chain, from the back of Morgan's belt. The tip of the spear comes off so you can fit it in his clenched right hand, but it's still hard to get it in there. I had to resort to carving some of the plastic out of the interior of the fist in order to get the spear in at all. The paint apps are quite nice. The metal armor looks worn and tarnished, and a wash on the chain mail creates some dark shadows. His lower legs are spattered with brown, making him look like he's trudged through acres of mud. 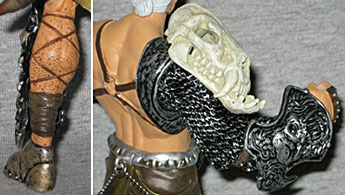 Articulation is average for a DCD figure, but with an extra balljoint for the animal skull on his shoulder (really) and a swivel joint instead of a hinged right elbow. This isn't the first time Warlord has had a figure - he actually had a whole branded line in the '80s from Remco, the kings of the professional knock-off. These days a property of Jakks Pacific, Remco made its name by copying other, more successful companies. 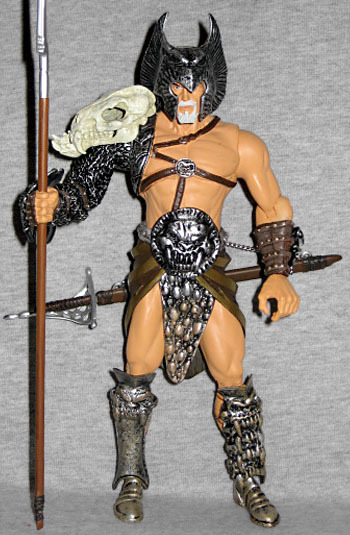 When Mattel came out with Masters of the Universe, Remco came out with Conan, Warlord and several other toys in the same scale and style to cash in on the trend. It's similar to the way SOTA designed their Street Fighter figures to mesh with Marvel Legends, but more blatant. So why, if the original series was canceled after three issues, did anyone make a toy? Or bother with an update, for that matter? Because it was eventually un-canceled and ended up running for nearly 140 issues, lasting until 1989. Warlord and the mystical land of Skartaris even appeared on an episode of Justice League Unlimited. The new series may have been a swift failure, but this figure is worth getting, even if you don't know the character. Save a spot next to him for the Conan that Marvel Toys will be releasing in their Legendary Heroes line, or that oversied He-Man Mattel has been working on, and these rugged barbarians can duke it out again.